Known as “Bobby V,” Valentine has enjoyed a long and successful career in baseball. His managing career began with the Texas Rangers in 1985 after serving as third base coach for the New York Mets. His coaching career includes: Texas Rangers (1985–1992), New York Mets (1996-2002) and the Chiba Lotte Marines (2004–2009). On December 2, 2011, Valentine was named manager of the Boston Red Sox, a position he held for one season. 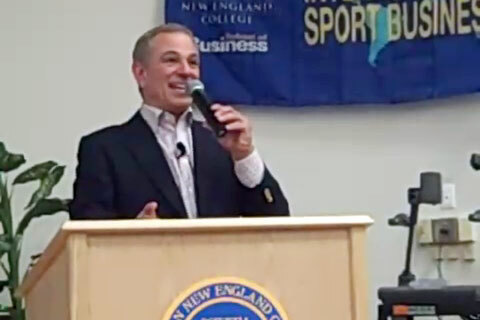 The following video shows Bobby Valentine at Western New England College in 2009 as part of the Center for International Sport Business “For the Love of the Games” speaker series. Bobby Valentine is popular keynote speaker says PFP Sports and Celebrity Talent Agency. If you would like to book baseball speakers or MLB stars like Bobby Valentine for a speaking engagement, autograph signing, guest appearance, charity fundraiser or special event, contact Bobby Valentine’s agent for speaker and appearance fees or call 800.966.1380.